Discover a secluded camp that sits on the edge of an immense pan. At Kalahari Plains Camp, large herds of gemsbok (oryx) and springbok arrive in the wake of the summer rains, attracting cheetah and black-maned Kalahari lions. Authentic San Bushman cultural experiences give insights into an ancient yet sustainable way of life. Stay in only 8 cool canvas suites with rooftop sleep-out platforms for unequaled views of the night sky. An unique eco destination in pristine wilderness. In marked contrast to the Okavango Camps, Kalahari Plains sits on the edge of an immense pan. Large herds of gemsbok (oryx) and springbok arrive in the wake of the summer rains, and attract the attention of cheetah and black-maned Kalahari lions. The annual transformations belie a sense of timelessness, and authentic San Bushman cultural experiences give insights into an ancient yet sustainable way of life. INSIDER'S TIP: Journey back in time on a guided walk to learn about the fascinating and ancient lifestyle of the San Bushman people. Place: Situated on an immense pan, Kalahari Plains lies in a remote corner of the Central Kalahari Game Reserve, a place famed for vast herds of antelope followed by abundant predators – including legendary black-maned Kalahari lions and feisty honey badgers. It also offers some of the best summer wildlife viewing in Africa. Game drives unlock wildlife treasures while respectful San Bushman experiences provide insights into a unique culture. Accommodation: Eight canvas units (including one family unit) each include a sleep-out rooftop platform from which to enjoy the night skies. 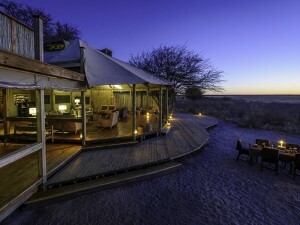 The camp, including its main area with pool and deck, takes in the sweeping, spacious views across the Kalahari. Solar power provides electricity and hot water, and innovative insulated canvas walls and roofs keep the temperatures inside comfortable. Purpose: In keeping with Wilderness’ objectives of using technologies and techniques towards reducing energy consumption and fuel use, and other resource-use reductions, Kalahari Plains is run on 100% solar power, and uses an ancient yet effective water harvesting technique. Situated cleverly on the edge of a huge pan south-east of Deception Valley in the Central Kalahari Game Reserve, Kalahari Plains Camp is one of Botswana’s Best Safari Holiday choices. This part of the Kalahari Desert is not visited as much as other areas of Botswana but game viewing here is spectacular all year round. One of only two camps in the extensive Central Kalahari Game Reserve, Kalahari Plains Camp is the perfect base from which to explore one of Botswana’s most rewarding game locations. Many of the staff are descended from the local Bushmen clans and will happily educate you about their ancient culture while you walk with them through the desert. he Camp is naturally designed with its timber and canvas theme and solar power for energy. 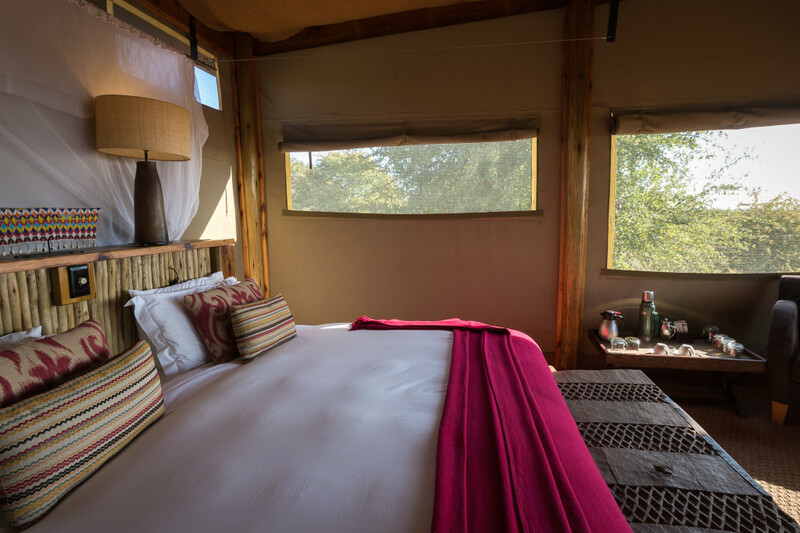 Kalahari Plains Camp is built with the landscape in mind – a huge open wooden deck open on three sides allows the breezes in and the sun out. A dining area at one end looks out onto a very welcome salt-water pool and shaded deck. Do try the ‘loo with a view’! A comfortable lounge fills the central space where guests can make coffee or read a book from the intimate library. Grab a drink from the bar and head up the roof where the starry skies are extra bright in the Kalahari Desert. Dinner is usually served in the boma but fires are not lit every night due to the shortage of wood in the area. Accommodation in 7 roomy tented villas includes two family cabins featuring second en-suite bedrooms for two children. All canvas villas are large and designed on elevated decks to make the most of the awe-inspiring views. Ceiling fans and large mesh windows deal with the heat in the desert while sandy pathways take guests to the main living areas. Children will love the sleep-out level above the tents which feels a lot like camping is cool and comfortable and adds the stars and sounds of Africa to the experience. Birding, Nature, Relaxation, Wildlife, And more. 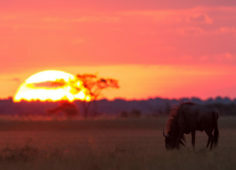 Experience some of Botswana’s most magnificent safari destinations with this Platinum standard journey. Stay in luxurious camps that merge with nature and offer every imaginable luxury to add to your comfort. Embark on a Kalahari exploration and appreciate the sheer beauty of such a stark landscape. Witness the enormous biodiversity in the Savuti Channel all day from your private deck at Savute Camp. And Kings Pool Camp lies within the Linyanti Wildlife Reserve, a place of extreme beauty.